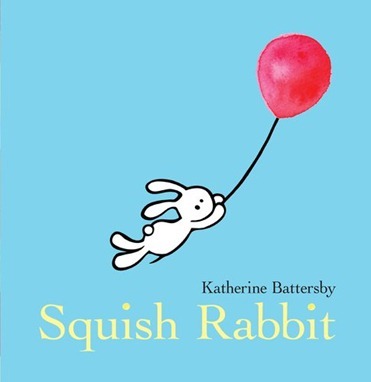 Squish Rabbit by Katherine Battersby. This was our most recent library find, a newer book about a little rabbit with big problems (like loneliness and getting stepped upon and losing balloons). It has very simple drawings accompanied by texture collages (sort of like a comic book Charlie and Lola) which drew me to it, but when I did a quick read through at the library, I found that Squish has a problem that Coryn often has and that I knew she could relate to: No one to play with because he is so little. While Coryn is usually bigger than kids her age (and some a year or two older), that doesn't cushion her from feeling small and left out when the playground is full of busy, fast moving eight-year-olds with their complicated games . . . or when there is simply no one there at all. Squish's attempts to remedy his lack of friends is a short, charming tale that Coryn asks to read over and over again. She especially likes the part where Squish, feeling frustrated and thinking he is all alone, throws a tantrum, and when he yells, "STOP!" at a fleeing potential playmate. It's not often I find new books that I like, so many seem to be produced rather than written, but this one is just right.